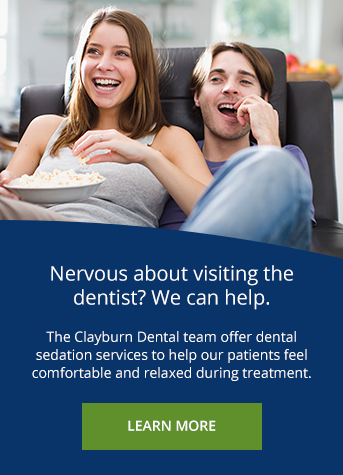 Read the Clayburn Dental blog for tips and advice about caring for your oral health and information about our dental services. How Do I Deal With a Dental Emergency At Home? If you experience a dental emergency at home, there are some steps that you can take take care of your injury until you can see your dentist. Here are some tips from our Abbotsford dentists on how to deal with a dental emergency at home. Want a new look for 2019? Our Abbotsford dentists offer Invisalign clear aligners to help you achieve a straighter smile without metal braces. Halloween usually means one thing: candy! While candy is a fun treat, it's important to be extra vigilant about oral hygiene at this time of year, to keep our oral health on track. Here are 5 tips from out dentists to help keep your smile healthy this year! Can Children and Teens Get Their Teeth Whitened? For a couple of important reasons, our Abbotsford dentists advise against teeth whitening for children and young teens. Can my dentist tell if I haven’t been flossing? If you are not flossing regularly, your dentist may not be able to tell right away… be he will eventually. Here, our Abbotsford dentists explain how they always know when their patients quit flossing! An effective oral hygiene routine is about more than just regular brushing and flossing. Here, our Abbotsford dentists review all the steps you should take to keep your teeth and gums healthy and clean. Regular oral cancer screenings are essential to your oral health because they allow your dentist to identify and treat abnormalities before they become serious to your overall health. I feel that one of the key elements of excellent dental care is establishing a healthy relationship built on mutual respect and trust with each of my patients. This helps them feel more comfortable with me, and gives me a better understanding of their oral health needs and goals.